Call and Respond Early (CARE) is a way of allowing patients, or their families and carers to call for rapid assistance when they feel that the healthcare team has not fully recognised the patient’s changing health condition. If you are worried about a noticeable worsening in your health or of the person we are caring for and the healthcare team is not responding to your concerns. If you are unclear about the more immediate next steps in your (or the person we are caring for) care or treatment. Use the call bell or go to the nurses’ station and talk to your nurse or doctor regarding your concerns. If you are still concerned, ask to speak to the nurse in charge of the shift. If you think it is urgent or remain concerned and feel that you have not had an appropriate response, call 9431 2156. If you need to access a phone, please speak to staff. ward and room (if known). 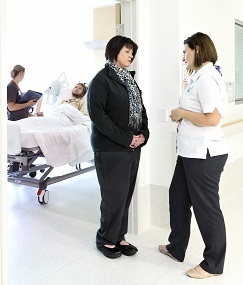 The CARE senior nurse will visit you on the ward and make a full assessment of the situation. They will also liaise with the treating medical team and other health care providers, as required. Remember call us if you are worried. Help us CARE for our patients safely together. When you are worried and feel like you are getting worse. The patient is looking unwell and you are worried about their safety. The patient shows any unusual behaviour that is not normal for them. Will I offend staff if I CARE for patient safety? No. Staff in this hospital support patient/family/carer involvement. We want you to work with us to create the best experience possible for you or the person you care for. CARE call should only be used when you feel the healthcare team is not responding to concerns on your worsening health or that of the person you care for. If you wish to report other worries, e.g. catering, parking, room allocation, housekeeping, please speak to the shift coordinator or ward manager. They will be able to offer advice on how to address these concerns.